Omni-mRNATM pooled reference mRNA is compatible with all commercially available labeling systems. Other applications of pooled reference mRNA include RNA ELISA, Quantigene, HPSA, and a number of other RNA amplification/detection systems. 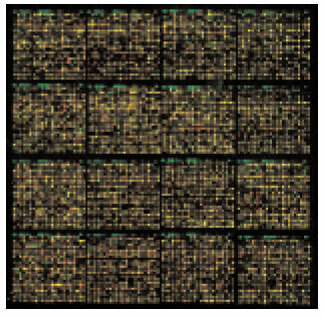 Omni-mRNATM pooled reference mRNA size distribution is from ~5 kb to 200 bp. These can also be used for cloning mRNA of interest by RTPCR. A 1.3 kb and a ~500 bp amplified cDNA fragment of p53 are shown in the figure. Human and Mouse Omni-mRNATM Amplified Pooled Reference mRNA (Catalog No. 08- 0100-50 and 08-0200- 50) was used for synthesis of First Strand cDNA (Catalog No. 10-0100-05 and 10-0300-05) and used as a template for amplification of rare and abundant messages. PCR products generated from Human Omni-cDNATM (lanes 2-5) and Mouse Omni-cDNATM (lanes 6-9). Individual lanes correspond to the following products; lanes 2 & 6 = GAPDH (~500 bp); lanes 3 & 4 = granulocyte-macrophage colony stimulating factor (GMCSF) (~250 bp); lanes 4 & 7 = tumor necrosis factor alpha (TNF-a) (~325 bp); lanes 5 & 8 = Interleukin-1 receptor alpha (IL-1R a) (~300 bp). Lane 1 = molecular weight markers (200 bp-1500 bp).